I just had ice cream for lunch...what did you have?? Ok, technically I'll eat my lunch later, but still, it's always fun to flip things around. You don't really expect me to drive the whole 3/4 of a mile back from the grocery store without eating one of these do you? Nah, didn't think so. 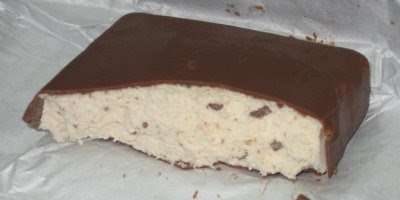 So, when's the last time you had a Klondike bar? yesterday? yesteryear maybe? I honestly can't remember it's been that long. A decade maybe? Did I even have my driver's license last time I had one of these? Does life go by that fast nowadays? I had trouble deciding which Klondike variety to pick. I was leaning towards the chocolate one (which I've never had) when I noticed that the Reese's ones had the least amount of saturated fat (50%). I would have loved to try Caramel Pretzel, but they didn't have any. The Reese's flavor was as I expected: Good! I wouldn't travel the globe for a Klondike bar, but I will enjoy this treat. It's a good middle of the road snack: good flavor, good texture, good quality, and even a nice aftertaste. It's good stuff, just like it always was. I guess they only thing I could possibly question is that I thought they use to be a little thicker than this, not that it didn't fill me, it just looked a smidge thin when I opened it. And, if you really want to know, it was gone in -9- bites...I should have gone slower I guess. Random Thought: don't ask me what made me think of this, but how good would this taste between two giant chocolate chip cookies? Don't ask me what made me think of this at 7 o'clock in the morning, but it made me hungry. On Second Scoop: Sure, it's only 9:15AM, but that doesn't mean it's too early to enjoy a Klondike bar. It's good to know they still make a nice product, pick one up if it's been awhile!